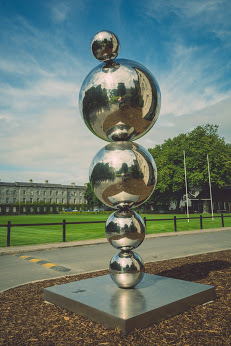 Artworks are a familiar sight around the campus of Trinity College Dublin, and they are part of a collection over 300 years in the making. Paintings are first recorded coming into the college’s collection in 1710, well before the founding of the National Gallery of Ireland in 1854. The earliest painting in the collection dates to the early 1600s. 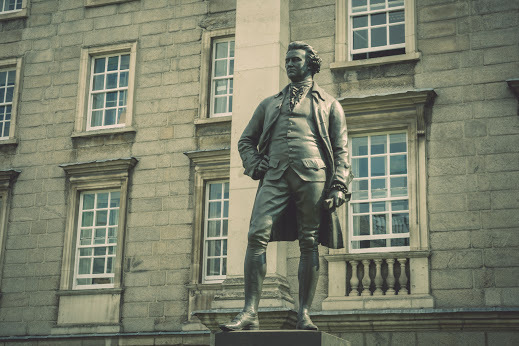 Statue of Edmund Burke by John Henry Foley. In its early stages, the collection was built up through a combination of commissions and bequests. Catherine Giltrap, curator of the TCD Art Collections, has noted the often commemorative function of a college collection, and this is particularly apparent in the early works in the collection. A bronze statue by John Henry Foley depicts Edmund Burke, who founded what was to become the Historical Society. The Dining Hall is adorned with portraits of former provosts. The older works in the collection testify to the history of an institution and honours the individuals who have helped shape it, a tradition continued with the recently commissioned Atoms and Apples (2013). This sculpture by Eilis O’Connell celebrates Nobel prize winning scientist Ernest Walton. Composed of spherical forms and surrounded by Irish apple trees, it not only reflects Walton’s work on splitting the atom, but also his passion for gardening. “Apples and Atoms”, Eilis O’Connell. Many significant bequests have been made to the college. 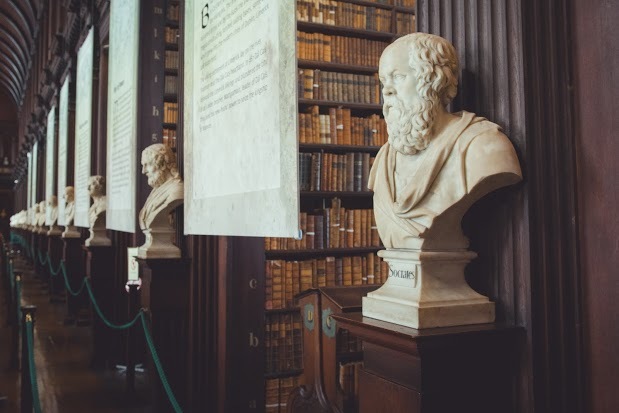 In the 1740s, Dr Gilbert bequeathed money for fourteen marble busts of “men eminent for learning to adorn the Library.” These busts, including such figures as Aristotle, Homer, Milton and Shakespeare, remain on display in the Long Room of the Old Library. The Madden bequest gifted twenty works to the Provost’s House, largely of the Italian school but also including a work by Dutch artist Peter Lastman, best known for his role as Rembrandt’s teacher. Marble Busts in the Long Room of the Old Library, Trinity College. The modern art collection was founded in 1959 by George Dawson, a well-travelled Genetics professor with a passion for art. Dawson introduced a College Gallery Art Hire scheme, which still functions today. This project is organised by a cross-disciplinary committee and allows staff and students with offices or rooms on campus to rent works from the collection. It aims to encourage a greater appreciation of art outside of gallery spaces and the development of a critical appraisal of art. 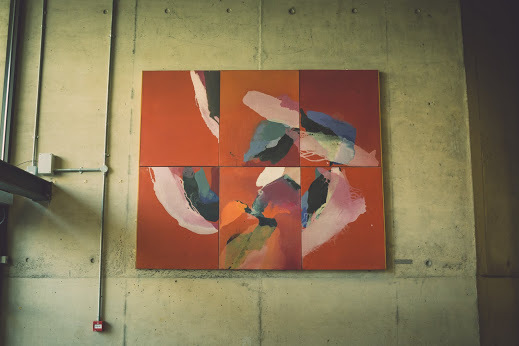 The same principle applies to the display of art works in college buildings – staff and students are surrounded by fine examples of modern and contemporary art as part of their everyday learning experience. The College Gallery scheme began with reproductions of Old Master paintings. When funds became available for the purchase of oil paintings it was decided that Irish paintings should be prioritised. In 1963, The Irish Times commented that the College Gallery had ‘the most representative collection of modern Irish paintings in the country.’ Oil paintings by international artists were more expensive, thus these artists are represented in the collection through their graphic work – prints and artists’ posters. These works, including posters by Picasso and Matisse, were largely purchased by George Dawson and were loaned and later gifted to the collection. Currently modern and contemporary art accounts for over half of the collection. 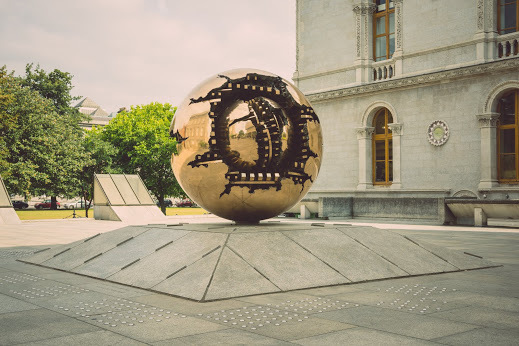 Sculptures on campus include Arnaldo Pomodoro’s Sfera con Sfera (1982-3) outside the entrance to the Berkley Library, a rotating sphere split to reveal its complex inner workings. An ambiguous piece, it is designed to respond to the surrounding architecture. Alexander Calder’s Catcus Provisoire (1967) is the only of his ‘stabile’ sculptures on public display in Europe. It mimics construction techniques with the use of rivets, and the welding of the ‘cut out’ forms. Both of these sculptures, by internationally renowned artists, were brought into the collection through the efforts of George Dawson. “Sfera con Sfera”, Arnaldo Pomodoro. When the Berkeley Library opened in 1967, it included an exhibition space designed by Paul Koralek in which the College Gallery Committee, composed of volunteer students, organised shows. In 1969, the College Gallery held an exhibition of Picasso’s work, the first in Ireland. This is characteristic of the progressive approach of the College Art Collections towards promoting modern and contemporary art. Other exhibitions include Pop Art, African art, American banners, the college silver collection and retrospectives of Irish artists. In 1978 the college’s current exhibition space, The Douglas Hyde Gallery, was opened. This gallery was initially multi-disciplinary, but following collaboration with the Arts Council in the 1980s, art became its sole focus. It continues to be a leading venue for the display of contemporary art in Ireland. Contemporary art has long been a priority of the modern collection. In the early 1980s, a series of exhibitions of work by emerging artists were organised by the College Gallery Committee, entitled Exposure. Many of the exhibitors are now well-known figures in the Irish art world – such as Michael O’Dea. The collection has always been supportive of new art, and Dawson often took risks in purchasing works by emerging artists. However, these artists are now noted as leading exponents of modernism in the twentieth and twenty-first centuries. The collection can be seen as highly representative of this period of Irish art, featuring works by such artists as Norah McGuinness, Mainie Jellet, Louis Le Brocquy and Evie Hone. Women artists were prominent in the establishment of Irish modernism, and this is reflected in the collection – an example is Anne Madden’s Big Red Mountains Series, (which at the time writing was) displayed in the Arts Block. “Big Red Mountains”, Anne Madden. Dawson commented that he ‘never saw the educational value in bare walls’. Through the vision of Dawson and his successors, Professor David Scott, Dr Peter Cherry and Catherine Giltrap, a fresh and engaging collection of art has been amalgamated and the Trinity campus has plentiful examples of modern and contemporary art of a high calibre by renowned Irish and international artists. This coexists with the historical collection. Along with Professor Anne Crookshank, Dawson was also instrumental in establishing the History of Art Department in Trinity in 1966. Dawson’s passion for art and science has continued in Trinity with such projects as the innovative Science Gallery which explores the relationship between art, science and technology. Professor David Scott spoke of Dawson’s ‘flair, imagination and foresight combine[d] with….strength of will and toughness’. The enthusiasm of this man and his successors has resulted in a strong collection, which is of great academic and visual interest. The collection is currently being digitised, an ongoing project since 2008, and it is hoped the artworks will be accessible online by Summer 2015. For more info, see tcd.ie/artcollections.